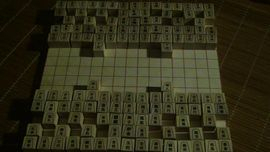 Shogi has its ancestry in much larger variants, Chu Shogi (12 x 12), and Dai Shogi (15 x 15). Chu and dai shogi feature a second king: the drunk elephant may promote to a crown prince. An opponent's crown prince, in addition to his king, must be captured to win. Upon entering the enemy camp, the drunk elephant, a relatively weak piece, may promote to a crown prince, which effectively acts as a second king. Chu and dai shogi also feature a very powlerful unconventional piece, the lion. The lion moves like a king, but up to twice in one move, possibly capturing on one or both of its moves. The lion is the only piece in chu and dai shogi that may capture two pieces in one move. Good news for chess players: No drop move in dai and chu shogi! 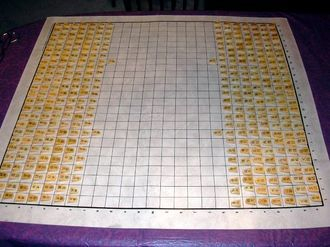 25x25 tai shogi features most of the pieces of dai shogi, plus some even more powerful pieces, such as the hook mover, which makes two rook moves in one move, and the empiror, which can jump to almost every square on the board. Games may last thousands of moves and is generally played in multiple sessions.